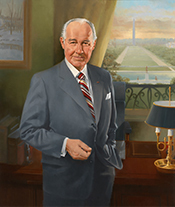 Bob Michel’s portrait, commissioned to commemorate his service as Republican Leader, was unveiled in Statuary Hall in 1992. 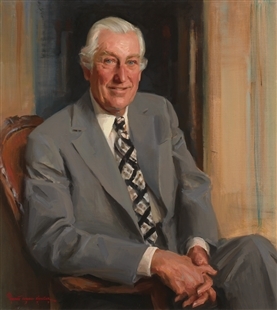 Painted by fellow Peoria, Illinois, resident Bill Hardin, the portrait is set in the West Front office occupied by minority leadership at that time. The painting highlights one of the space’s most exceptional features—the view down the National Mall, punctuated by the Washington Monument.